After viciously assaulting a corrupt but powerful clergyman Robin Hood flees the only home he has ever known in Wakefield, Yorkshire. 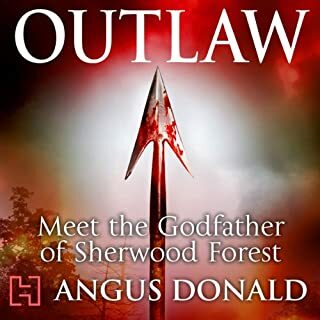 Becoming a member of a notorious band of outlaws, Hood and his new companions - including John Little and Will Scaflock - hide out in the great forests of Barnsdale, fighting for their very existence as the law hunts them down like animals. 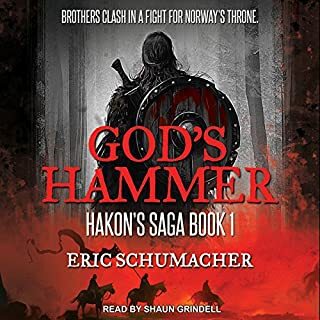 When they are betrayed, and their harsh lives become even more unbearable, the band of friends seeks bloody vengeance. Roland Inness desperately needs meat for his starving family, but he takes the wrong deer on the wrong nobleman's land. Worse yet, he uses his longbow, a weapon outlawed and suppressed by the Norman overlords of England. Now they are coming for him. With one shot the 14 year old peasant boy is launched on a desperate flight that takes him from the mountains of Derbyshire to the wild frontier of Wales and on to the court of Richard the Lionheart. When he's caught stealing, young Alan Dale is forced to leave his family and go to live with a notorious band of outlaws in Sherwood Forest. Their leader is the infamous Robin Hood. A tough, bloodthirsty warrior, Robin is more feared than any man in the county. And he becomes a mentor for Alan; with his fellow outlaws, Robin teaches Alan how to fight - and how to win. As Fine a "Fictional Saga" as Lonesome Dove! The Knights Hospitaller battle ancient evil in medieval Rhodes as mysterious disappearances and insane devil-worshippers threaten to turn the entire island into a bloodbath...When three Hospitallers go missing from a local village outraged Grand Master Foulques de Villaret sends the English knight Sir Richard-at-Lee and his trusted sergeant-at-arms Jacob to discover their fate. December, 1323 AD - Holly and ivy decorate the houses while voices are raised in song, but the Christmas cheer is tempered by terror this festive season, as demons haunt a small English village. Strange thefts; cloven hoof-prints in the snow; a house burned to the ground. Something evil stalks the icy streets of Brandesburton and former mercenary Tuck must find out what, before it's too late. As he sets out to solve the mystery the friar prays his faith will protect him. Great performance of a grand story. For decades, the brothers of the Sixth Order have fought a savage war against the Lonak clans amid the frozen peaks of their dominion. When word reaches the North of a fresh outbreak of the dreaded Red Hand, Brother Sollis, the finest swordsman in the Order, leads a small band to a long-abandoned castle in search of a potential cure but discovers a far greater threat lurking in the mountains. Enemies become allies as Sollis leads an increasingly desperate fight against an inhuman enemy steeped in the power of the Dark. Sir Guy of Gisbourne is back! 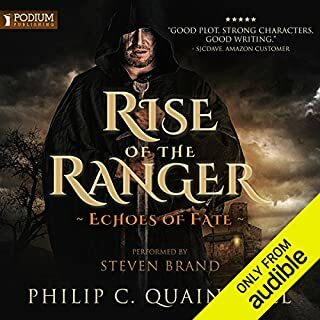 The greenwood has been quiet, and the outlaws have become complacent, but the harsh reality of life is about to hit the companions with brutal, deadly force, thanks to their old foe, Prior John de Monte Martini. 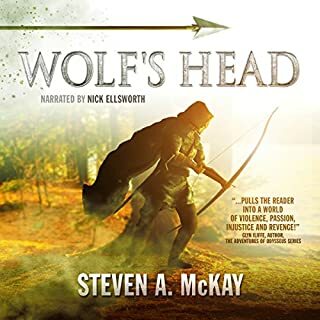 From a meeting with King Edward II himself to the sheriff's tournament with its glittering prize, the final, fatal, showdown fast approaches for the legendary Wolf's Head. New friends, shattered loyalties, and a hate-fueled hunter who threatens to wipe out not only Robin's companions but his entire family will all play their part in the Rise of the Wolf. Another great story read by a wonderful character voice master. The adventure continues on with Robin full up against Sir Guy. Usually by the end of a trilogy you just want it to be over. In this one this whole book was the climax. It was incredible. It made you want to listen to the very end and made you wonder how everything was going to work out in the end. I am excited for the next book to come along and finish everything up. I love the plot of this one as some characters are brought back and how he ties everything together. He allows the characters who are fully developed to do what they do best and what they should do. It is intense and makes you want to be a part of the story. 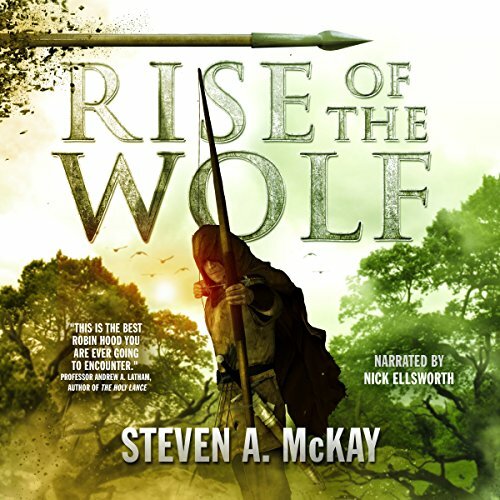 What other book might you compare Rise of the Wolf to and why? I can't compare it to anything that I've read because I haven't read many books from this time period. Which character – as performed by Nick Ellsworth – was your favorite? Allen Adele in this one was my favorite. He was a big part of the book but when he narrates him you can tell that he is a jovial being. If you could sum up Rise of the Wolf in three words, what would they be? What was one of the most memorable moments of Rise of the Wolf? Another excellent offering from Steven McKay. He has a very engaging way of telling a story so it never drags or gets boring. The tale holds one's attention to the end. Descriptions are vivid and graphic yet most likely accurate to the period. One really gets the feeling one is there with the characters. The story also gives a sharp impression impression what it must have been like in those times. Let me not say anymore. Read it for yourself !!! This could've done with some better editing around chapter endings and the pauses between paragraphs. I didn't buy this for asmr mouth sounds. They just keep getting better. Have you listened to any of Nick Ellsworth’s other performances? How does this one compare? He got better with each book, and he's read the whole series. This is a faithful capture of the Robin Hood legend. The characters are fantastic. It's brilliantly paced, too. I laughed and cried, and couldn't put it down. I usually like my heroes to be real people and my novels based, however loosely, on fact. However, this series has had me hooked from the first paragraph of book one, to the last word in this, the third of the series of four. Robin Hood and his band of outlaws are a surprisingly likeable bunch of human beings, you can feel for the characters, and find yourself rooting for them when faced with authority, which, to me, is a sign of excellent workmanship by the author. For me the series contains the perfect balance of action, intrigue and just a little romance. Perfection. I really cannot wait for book four, although I feel a little sad that it will be the last. I would recommend this book to any reader who enjoys historical novels, be it Roman, Egyptian, etc. I came out of my comfort zone and was very pleasantly surprised. You will be too. Thoroughly enjoyed the performance. 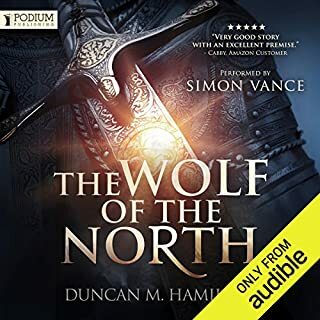 This series reminds me a lot of the Sharpe series, in that it's a well characterised romp through pseudo history that you know the hero will be alright in the end. Relaxing and fun listen with great action. 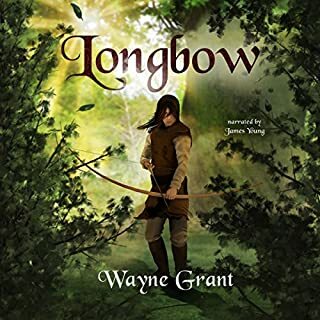 a great end to a trilogy whos story is intertwining history and fiction to bring robin hood and his men to life in a new way. a fitting end or hopefully start of new series !